Your first club game is like your first day at a new school. You walk through the door and find that everyone knows one another. They’re asking about each other’s families and work, chatting about hands and tournament results. It’s a club! Now you’re a member, and it’s just a matter of time before these are your friends as well. Don’t hesitate to tell people you’re a newcomer. You’ll find many players eager to show you the ropes. Before you play, you and your partner need to fill out a convention card. A convention card is just that: a card that shows the conventions you use along with your general approach to bidding. The card serves two purposes: One, it tells your opponents what you play. (They, by the way, not you, are the only people entitled to look at it during the game, though clubs are somewhat lenient about this rule for the new player.) Two, making out a card allows you and your partner to get your understandings straight. Many longtime partnerships have improved just on this alone. At first sight, the card can be intimidating. Don’t worry about filling it out in detail. You’ll see that it already has common conventions such as Stayman and Blackwood used by many social players. Dozens of other conventions have been invented to describe various hands, and you’ll discover some you enjoy using. For now, just remember that unusual conventions are shown in red on the card. Your opponents will “Alert” them by saying the word or using the “Alert” card in the bidding box. You may ask for an explanation when it is your turn to call. Bids shown in blue require an “Announcement.” For example, when your partner bids 1 Notrump, you “announce” to your opponents the Notrump range. Most pairs use 15-17 or 16-18. Some have more unusual methods. Most games now use bidding boxes filled with cards designating every possible call. One of your opponents or the director, the official who conducts the game, will show you how to use them. The cards provide an instant review of the bidding and eliminate the possibility of mishearing an auction. You may enjoy using them so much that you buy a set for your home games. You’ve found your table and greeted your opponents. The director will place duplicate boards with cards to shuffle and deal. Instead of dealing them to a player, deal them in front of you and insert each hand into one of the slots in the boards. Each hand is dealt only once. No more shuffling! Now, just pick up your hand, noting from the board instructions who is dealer, and play bridge. To keep each deal intact for the next round, place each card face down in front of you on the table, pointing toward your partner if you win the trick, toward the opponents if you lose the trick. As declarer, you will tell your partner which card to play instead of pulling the dummy yourself. The dummy doesn’t ask to see your partner’s hand or walk around the table for a peek. Since the hands remain intact, there is opportunity later to look at them. Also remember to make your opening lead face down to prevent leads out of turn. Many players will make their lead while asking their partner, “Do you have any questions?” Partner may shake her head no or may then ask for an explanation of an opponent’s bid. When the deal is complete and the result agreed upon, the North player will enter the result on a scoresheet later used by the director to determine overall winners. You will want to record your own scores on the reverse side of the Convention Card. The private score card contains the board numbers and vulnerability and spaces for you to record the result of each deal. There is also space to estimate your points and record the final result for each board. Many players, however, use the extra space for notes. Most clubs now use a computer program called ACBLscore, and the director may print out the scores for each player from the program. Duplicate is scored like Chicago or party bridge. If your side makes a contract, you receive your trick score, plus a bonus of 50 points if you bid and make a partscore, 300 if you bid and made a non-vulnerable game, or 500 points if you bid and made a vulnerable game. Each deal stands alone and has no effect on any following or previous deal. If you don’t know the score of a particular contract (4 Spades making 4 doubled is one most players never forget! ), just look on the back of the cards in the bidding boxes. You will play two to four boards at each table and a total of 20-28 for the entire session. To keep the game going smoothly, each round is timed. You are allowed an average of about 7-1/2 minutes for each board so you will want to learn to use your time wisely. 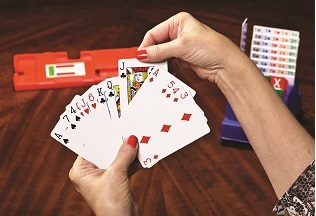 Duplicate bridge is a sport and sports have rules. The rules ensure that the game is fair for everyone (the field). You’re not expected to memorize the entire Laws of Duplicate Bridge. But don’t hesitate to politely call the director to your table if you think a rule has been broken. Never be intimidated when the director is called because you may have broken a rule. Director calls are just another learning experience. A good director will present the ruling in a manner that doesn’t embarrass or offend anyone. Accept rulings with grace. The director matchpoints the results on each board. You receive one matchpoint for each pair whose result you have beaten and one-half a point for each pair whose results you have tied. When you add up all of your matchpoints, you’ll see whether you did better or worse than average. You also will be able to see which boards you found troublesome and take the opportunity to discuss them with some nice former opponents. Was there a way to make 6? If you placed in the top 40% of your section in the game, you will be awarded a prize: Masterpoints, the coin of the bridge-world realm. Bridge is as friendly as the players and it’s important to be a good partner and opponent. Thank your partner when she puts down the dummy. Wish the opponents good luck before you start the game. Don’t get upset about a bad result. Instead, start fresh with the next 13 cards. Successful partnerships will discuss difficult hands and situations where something went wrong after the session in private. Bridge is a game. Have fun!